Research carried out at the University of Aberdeen suggests hen harriers can co-exist with profitable grouse shooting. Scientists have developed a model showing the densities at which the birds can survive together. The study found that in areas where hen harriers breed at levels that have a significant economic impact on grouse shoots, some chicks could be removed. They would then be reared in captivity and released into the wild elsewhere. The stand-off between grouse moor managers and conservationists working to protect hen harriers, which feed on grouse, is one of the UK's most contentious wildlife conflicts. The research focused on grouse moors in England, where the hen harrier is said to be close to extinction as a breeding bird. But Prof Steve Redpath, who headed the Aberdeen team, believes the findings are relevant to Scotland. 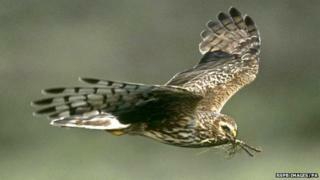 Similar schemes are used in continental Europe in regions where harriers breeding in crops are threatened by harvesting. Prof Redpath said: "Any decision about how to use this model depends as much on politics as on science. "However, if both sides are interested in pursuing the idea, this model provides a framework for this dialogue to take place." RSPB spokesman James Reynolds said: "We look forward to reading this paper and it could play a major role in helping to resolve the hen harrier-grouse conflict. "A brood management scheme may merit experimental investigation in the future, but only once hen harrier numbers have recovered to a pre‐agreed level and less interventionist approaches, particularly diversionary feeding, have been widely attempted. The research is published in the British Ecological Society's Journal of Applied Ecology.